A beautiful collection of over 30 minimal, individual WordPress themes for you. 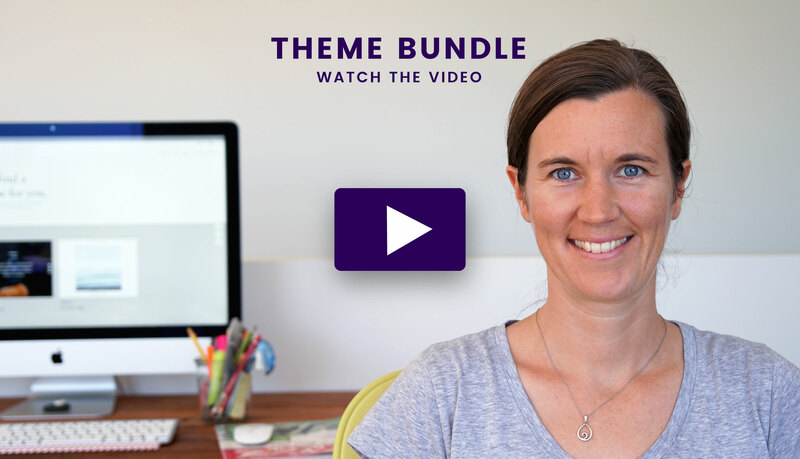 Our entire theme collection is included in the Theme Bundle. You will also receive all new themes and theme updates we publish within one year starting from your purchase date. For all Theme Bundle renewals, you will receive a 50% discount coupon from us. Each one of our themes is individually designed and coded with love. We don’t do bulk work, instead we create themes we would love to use ourselves. Our designs are individual, so your website will not look like a theme, but rather like an individually created website just for you. All our themes have a minimal, clean and timeless design (with a little bit on an arty character), so your website won’t look outdated any time soon. The responsive layout will guarantee that your website looks great on mobile devices, tablets, laptops and big screens alike. All our themes are compatible with the latest WordPress version. We also prepare regular updates fixing smaller bugs and adding new features. You can find all information about new theme updates on our Theme Update Info blog. We use the Customizer with it’s amazing live preview feature for our theme customizations. Our customization options are super easy to use and we make sure that we only include options that are really needed for each specific theme. You can find a list of all plugins that are especially prepared for each theme in the theme documentation. We also prepared a list with general WordPress plugin recommendations that we update on a regular basis. Do you have questions about a theme? No problem, we answer all your theme-related questions in our support forum. The support is not limited to a certain time frame. If you purchase the Theme Bundle we help you with any issues you might run into. You can’t decide which themes will work best one for you? Or you are not sure, how your website should look like yet? Just head over to our theme showcase and get inspired. We love all the amazing people using our themes so creatively, it’s a true source of motivation. No worries, if you change your mind or you are not 100% satisfied with your purchase, you can just send us a short note within 30 days from your purchase date and we refund you your purchase within 3 working days. No questions asked, we want you to be happy with your purchase.